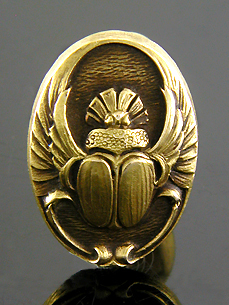 Strikingly elegant winged scarabs from the late Victorian era. 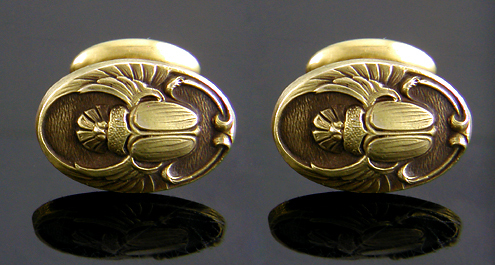 These finely sculpted, beautifully detailed cufflinks are a wonderful wedding of Egyptian Revival and Art Nouveau tastes. Created by Sloan & Co. in 14kt gold, circa 1900. Among the ancient Egyptians scarabs were viewed as a symbol of creation and rebirth associated with daily journey of the sun across the sky. In the years around 1900 there was a fascination with the arts and beliefs of ancient civilizations and jewelry of the time often incorporated symbols and motifs from the distant past. These cufflinks are beautifully modeled and richly detailed. The natural patina of the gold throws the winged scarabs into high relief and creates a sense of ancient, hidden mystery. The backs of the cufflinks are as nicely crafted as the fronts. The solid tops are attached to oval backs with sturdy split bridges. The curve and flair of the bridges helps assure that the links remain properly oriented on the cuff. The cufflink makers of the past always paid close attention to the small details. Sloan & Co. was an innovative fine jewelry maker located in Newark, New Jersey during the Victorian era and early 20th century. The maker's mark of Sloan & Co. (the Greek letter "psi") is stamped with the precious metal mark ("14") on the curved bridges. 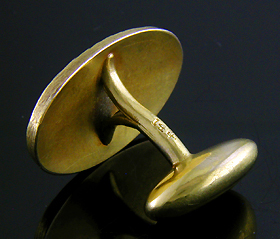 Measurements: These elegant 14kt gold cufflinks weigh a total of 5.4 grams. The oval tops are 3/4" long and 1/2" wide.